Infamous mushroom-shaped cloud from the detonation of the first fusion nuclear device. November 1 is the anniversary of Operation Ivy Mike. Ivy Mike was the first detonation of a fusion thermonuclear device. 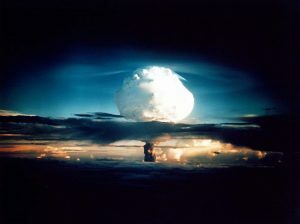 The United States conducted the test at the Enewetak Atoll of the Marshall Islands of the Pacific Ocean. The device was a concept weapon to test the theoretical design of the Teller-Ulam thermonuclear weapons. The 82-ton device was essentially a large thermos of liquid deuterium. An atomic bomb was installed above the deuterium dewar to initiate the fusion process. A rod of plutonium sat in the center of the dewar to act as a ‘sparkplug’. Surrounding the dewar was four and a half tons of uranium encased in sheets of a lead and polyethylene to focus the x-ray radiation from the atomic bomb into the plutonium to cause it to go critical. These explosions would force the hydrogen isotopes together and cause the desired fusion reaction. The entire assembly was encased in a foot of steel and nicknamed ‘The Sausage’. The Sausage was installed in an aluminum building on the tiny atoll island of Elugelab. On the morning of November 1, 1952, Elugelab was effectively removed from the face of the Earth. The detonation of the device produced an explosion with an estimated yield of 10-12.5 Megatons of TNT. It produced a fireball two miles wide and a mushroom cloud that reached an altitude of 57,000 feet in less than 2 minutes. By the 3 minute mark, the cloud was 108,000 feet tall. The 1 square mile island of Elugelab was replaced by a crater 6,240 feet in diameter and 164 feet deep. The Thermonuclear Age was born. 1993 – Severo Ochoa died. 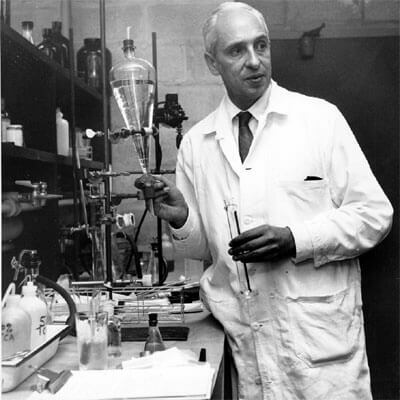 Ochoa was a Spanish biochemist who shares the 1959 Nobel Prize in Medicine with Arthur Kornberg for outlining the mechanisms involved in the synthesis of DNA and RNA. Ochoa discovered an enzyme in bacteria that allowed him to synthesize ribonucleic acid or RNA. He discovered the enzyme while researching high-energy phosphates. The enzyme’s main function was to degrade RNA but under laboratory conditions, it could run the process in reverse. 1952 – The United States tests first thermonuclear device. 1950 – Robert B. Laughlin was born. Laughlin is an American physicist who shares the 1998 Nobel Prize in Physics with Daniel Tsui and Horst L. Störmer for their discovery of the phenomenon where a quantum fluid that behaves as if it were made up of particles with electrical charge less than the elementary charge. This fluid is called the fractional quantum Hall effect. Tsui and Störmer were investigating the Hall effect at near absolute zero and discovered the induced current changed in quantized steps where it appears the charge carriers in the current carry exact fractions of an electron’s charge. Laughlin proposed the extreme magnetic fields induce the charge carriers into a quantum fluid state where new quasi-particles are formed to carry 1/3 of an electron’s charge. 1911 – Donald William Kerst was born. Donald W. Kerst’s Los Alamos ID picture. Kerst was an American physicist who invented the betatron which accelerated electrons through magnetic induction with sufficient energy to cause nuclear transformations. His first betatron produced a stream of electrons at 2.3 MeV. Future versions would use tuned magnets to account for the relativistic speeds of the electrons and produce energies near 300 MeV. Betatrons are used in nuclear and medical research to produce gamma rays and x-rays. 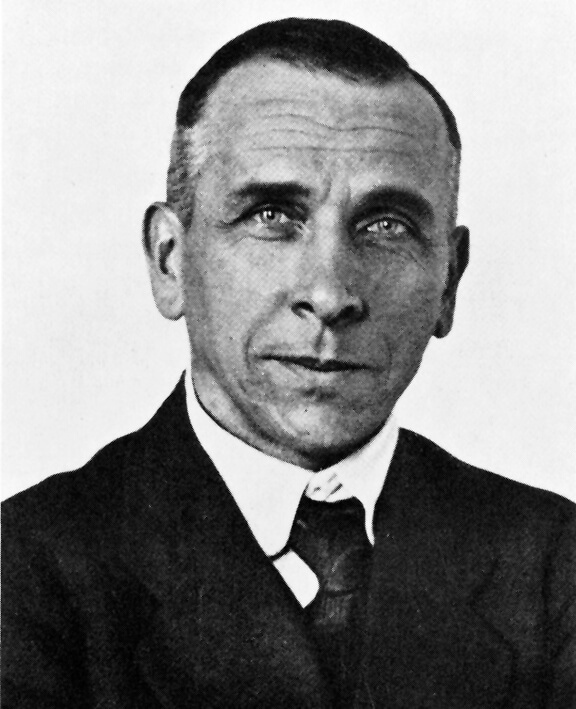 1880 – Alfred Lothar Wegener was born. 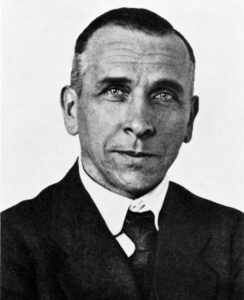 Wegener was a German meteorologist and geologist who introduced the idea of continental drift. He noticed the different land masses seemed to fit together if rearranged. This led him to hypothesize the continents had slowly moved across the surface of the Earth. He also noted the similarity between fossils and rock types found on opposite sides of the Atlantic. This theory was not widely accepted until the 1950s when supplemented with the study of plate tectonics.